Singer/songwriter and guitar virtuoso Richard Lloyd was the legendary guitarist for the seminal punk band Television. He has also enjoyed solo success since the 1980s. 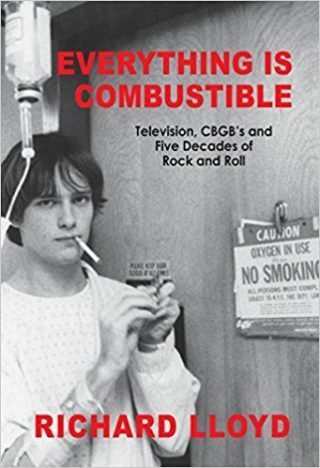 His new autobiography ‘Everything is Combustible: Television, CBGB’s and Five Decades of Rock and Roll’ reveals his extraordinary life (recalled from the deepest recesses of Lloyd’s photographic memory) from the important role he played in creating the punk scene in New York (by being the CBGB’s ‘flagship’ band) to his many fascinating adventures in the music business. Those “adventures” he shares in his new book include his close relationships with Keith Moon, Jimi Hendrix, and Keith Richards, and Lloyd succeeds in shedding new light on these artists, despite the abundance of material that’s been previously published about them. Equally enthralling is Lloyd’s harrowing, unflinching examination of his decades-long struggles with drug addiction, which ultimately led him into his current, spiritual life and outlook. I can’t remember the last time I read the memoirs of a recovered addict in which I so deeply felt their emotional struggle for recovery, not merely their physical. Photo of Richard Lloyd by Marcia Resnick. Photo courtesy of the artist. All rights reserved. All of this and more fuel his memoir, the result of which this writer found herself doing something that I haven’t done in ages: devouring a bio in one sitting. A major reason that I found myself unable to put this book down until I’d finished it was because it avoids doing what many (if not most) music-related memoirs do: becoming bogged down with dry, often boring details. All in all, Richard Lloyd’s memoir is wonderful; totally unlike any other book I have yet read by/about a noted musician. Be looking for my upcoming interview with Richard Lloyd, coming soon! This entry was posted in Books, Miscellanious and tagged Punk music, Richard Lloyd, television. Bookmark the permalink. Great precise review. A fabulous book and musician.